Q. What can you do with the Calendar views? Q. What makes the LightArrow Agenda view so powerful? Q. How do I customize colors for items in the Calendar? Q. Why are My Calendar Items Not Showing In Agenda & Calendar Views? At LightArrow, we understand that your calendar is one of the most important tools that you use for daily life. That’s why we provide you with easy-to-read and user-friendly views for your calendar. Our apps provide you with a variety of views including Agenda, Day, Week, Month, and Year. Furthermore, you can choose the calendars (Google, Yahoo, Outlook, etc.) and items (Appointment, tasks, etc.) you wish to view on your calendar by tapping the filter icon in the upper right of the calendar. LightArrow apps allow you to add a variety of different types of items including appointments, audio items, bill payments, drawing items, events, expenses, notes with tags, occasion reminders, photo items, projects, quick inbox items, checklists, reminders, shopping items, shopping lists, tasks, trips, video items, visits, health stats, medication, nutrition items, activity, wellness items, and more. This variety gives you an advantage over traditional calendars that only include events. Filters: The filter examines the calendars and types of items that you request to show on calendars, and then presents qualifying types of items on your calendar views. Quick Add: The ability to quickly add a variety of different types of items directly from the Calendar or Quick Menu. Quick Log: The ability to quickly log a variety of different metrics directly from the Calendar or Quick Menu. LightArrow apps interact with all your external calendars via the iOS calendar (the calendar that comes with your iPhone or iPad). 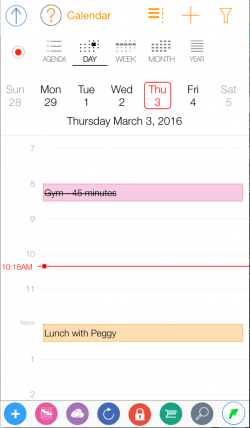 Consequently, LightArrow apps can work with the calendars that the iOS calendar supports. For example, if you want to view events from your Google Calendar, then you must add your Google account to the Mail, Contacts, Calendars section of your iOS device’s settings, and give the iOS calendar access to it. 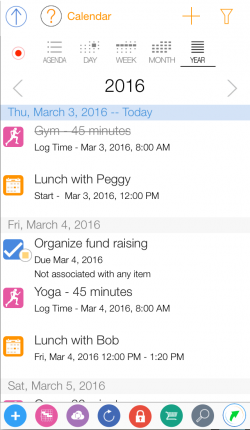 When you first download your LightArrow app, it will ask you if you want to grant access to your iOS calendar. If you initially deny access, you won’t be able to see or interact with events from your iOS calendar or any other calendar that you’ve granted access to your iOS calendar; however, you can change this option, as described below. If using iOS 7, go to your device’s settings. Tap Privacy and then tap Calendars. Move the switch for your LightArrow app to the ON position. The filter icon at the top-right of the Calendar enables configuration of the items you wish to show or hide in this view. Tapping the checkboxes enable or disable the viewing of the items that are listed. You can show the calendars you wish to view events from (such as iCloud, Exchange, Google, Yahoo, Aol., or Outlook.com) and you can choose whether or not to show iOS reminders. You can also choose the types of LightArrow app items you wish to display, such as closed items (completed tasks, etc. ), appointments, audio items, bill payments, drawing items, events, expenses, notes with tags, occasion reminders, photo items, projects, quick inbox items, checklists, reminders, shopping items, shopping lists, tasks, trips, video items, visits, health stats, medication, nutrition, activity, and wellness. Important: If you’re not seeing events from your calendars (such as Google calendars) or LightArrow app items, tap the filter icon to see what’s filtered out from the calendar. You can choose which calendar your LightArrow app uses as your default calendar if you have multiple calendars. For example, you can choose from your iOS calendars, Google Calendar, Yahoo Calendar, etc. This is the calendar that your LightArrow app will add items to, if desired. You can control this via LightArrow app settings. You can choose whether or not your LightArrow app items (tasks, projects, events, occasions, shopping lists, trips + visitors, bills, and other calendar items) are displayed on your built-in iOS calendar, and you can also choose when you would like to be notified by your device. Each item can be managed individually; for example you can be notified 30 minutes before each appointment and seven days before bills are due. We suggest that you show the items on your iOS calendar so you can take advantage of your device’s alarms and notifications. In the Settings view, the app provides you with a variety of ways to manage the alarms for your items. For example, these notifications include options from “No calendar entry” to “Remind 60 days before.” Refer to your Settings help for more information. View overdue and undated items. Create or add most items available in your LightArrow app, such as tasks, shopping lists, notes, etc. via Quick Add. Quickly log an item, such as activity or medication via Quick Log. View, add, and modify checklists/to-lists. Incomplete shopping lists for which due dates have passed. Unpaid bills for which due date has passed. All open items that do not have a date associated. In the Alerts & Agenda Checklists section of the Agenda view, tap the Overdue tile. The Overdue view appears, which allows you to manage any of the items that are listed. After tapping an item to expand it, you can selection any of the options that are available for the selected item to manage it. Note: Through My Settings, you can change the behavior of overdue items. You can choose whether overdue items include only overdue items, items due later today, or to exclude items due today. In the Alerts & Agenda Checklists section of the Agenda view, tap the Undated tile. This tile provides access into any task, shopping item, or iOS reminder that you haven’t set a date for. The Undated Open Items view appears, which allows you to manage any of the items that are listed. It is divided among, Tasks, Shopping, and iOS Reminders. Tap any of these options (Tasks, Shopping, iOS Reminders) to see a grouping of these items. After tapping an item to expand it, you can select any of the options that are available for the chosen item to manage it. Refer to Checklists to learn about creating checklists. Items with the dates designated for the current day, the following day, and the next seven days appear in these sections. This includes items such as checklists, appointments, bill payments, events, expenses, notes with date tag, occasion reminders, projects, quick inbox items, checklists, reminders, shopping items, shopping lists, tasks, trips, visits, health stats, medication, nutrition stats, activity, or wellness stats. However, you can filter these items as desired. All of the items in this section can be modified via the expanding cell. In addition, items can be added to the Hot List or converted to a different type of item. 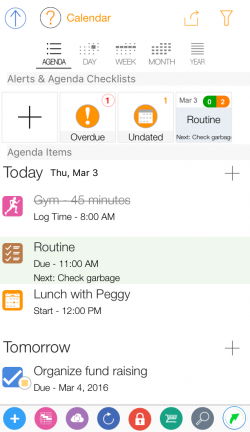 You can set the status of a task or change the due date of a task directly from the Agenda view in a few simple taps. In the Agenda view, locate the task you wish to set status for. When the cell expands, tap Status or Due. If you’re setting a due date, tap Due and then tap the desired due date. If you’re setting the status, tap Status and then tap On Hold, In Progress, Completed, or Canceled. Many types of items can be converted to different types of items. For example, an iOS reminder to buy milk can be converted to a shopping item. In the Agenda view, locate the item you wish to convert. When the cell expands, tap Convert. The app presents the types of items the item can be converted to. Tap the item you wish to convert it to and then complete the fields. The Day view includes a detailed list view for the day. It shows you your appointments and tasks, workouts, projects, events, etc. – depending on what you’re managing for a given day, and they’re color-coded for your convenience. If you’re using multiple calendars, the events are color coded by calendar. Tapping the appointment accesses the event’s details. You can manage your items directly through this view. The Week view gives you a good overview of the items that you’ve scheduled for the week. It shows you your appointments and tasks, workouts, projects, events, etc. – depending on what you’re managing, and they’re color-coded for your convenience. 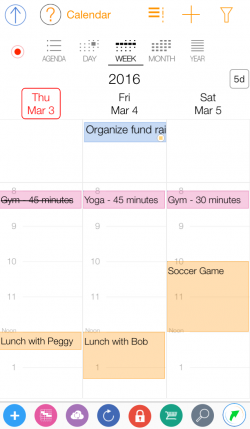 Items from external calendars are also color-coded based on their calendar. Managing the items is easy – just a tap away. The Month view includes detailed list views and a calendar for the month. It shows you a list of your appointments and tasks, workouts, projects, events, etc. – depending on what you’re managing, and they’re color-coded for your convenience. 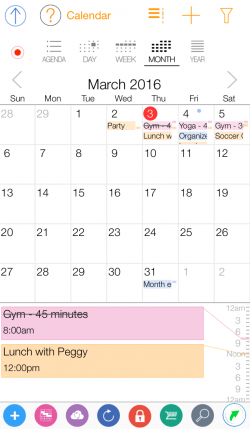 Items from external calendars are also color-coded based on their calendar. You can easily choose the day you want to view by tapping the date on the calendar. There’s an indicator on each day to show you if items are scheduled on those days. You can also completely manage those items by tapping them. The Year view allows you to scroll through a list of all your appointments and other items in one view for the entire year. It shows you a list of your appointments and tasks, workouts, projects, events, etc. – depending on what you’re managing, and they’re color-coded for your convenience. You can also access past years’ items. You can manage your items directly from this view. The plus sign in the top-right of the screen. The Quick Menu at the bottom-left of the screen. Tap the plus sign at the top of the Calendar view. Choose the type of item you wish to add. Note: If you access Quick Add from the Quick Menu, more options are available. The additional items are items that normally don’t include due dates; therefore, typically you don’t add them to your calendar. Use Quick Log to quickly log items such as your activity, nutrition, health stats, and wellness. Refer to Health + Goals for more information. In the Day view, use the arrow keys to navigate to the previous or next day. In the Week view, use the arrow keys to navigate to the previous or next week. In the Month view, use the arrow keys to navigate to the previous or next month. In the Year view, use the arrow keys to navigate to the previous or next year. To go to the current day, tap Today.